You know I hate to shop and I love the ease of shopping on line. eBay and Amazon are my best friends. Almost every day we have a package of something arriving on our front porch... coffee, syrup, batteries... anything most people would run to Walmart for. It works for us. I save a ton of money and even more important a ton of time. An added benefit has been becoming friends with our UPS carrier and his family. Really, not kidding here. We swap canning hints and stories of the kids and even some Christmas celebrating. While the Christmas shopping, and shipping, season is upon us, our family is excited to be expecting a different kind of package, not so much from UPS, but rather a new little Wachter. At just 15 weeks along "Henry" has become an incredibly special part of our family. We only recently told the little children because we needed to get past some complications and wanted to get some positive feedback from our specialist before we let them get too hopeful. Since we told them, they are beside themselves and keep asking when they can tell the world. But here's the thing. I used to think it was so exciting to share this news with those we know and love and even those we don't know. But now I dread it like the plague. Because people always say the dumbest things. And it just crushes my joy. After two surgeries, lots of painful treatments, a heartbreaking experience with a foster child and years of prayer to overcome endometriosis, we were literally beside ourselves with joy to share news of our pregnancy with Emma Rose. We were amazed at how the Lord had worked in what three doctors called an impossible situation and wanted to share our miracle with everyone. A lady actually told me I shouldn't appear so happy because it might upset two other ladies we knew who were struggling with infertility. Then there was the time when Nathaniel was six months old and we announced Aedan was on the way. We'd already had a round of nastiness from our family and could really use some positive feedback. I ran to the ladies room in tears when a friend of ours actually said, to my face, that I was like a regular baby factory. 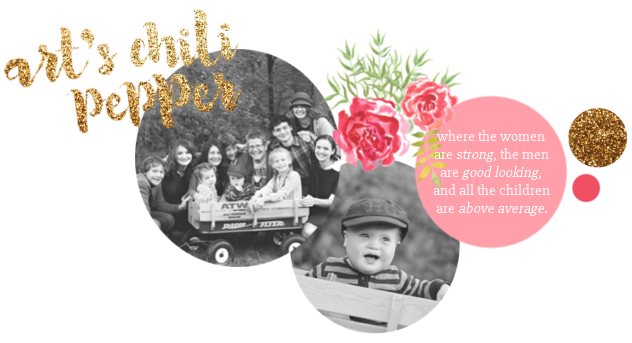 There was the time when I was expecting Samuel and another homeschooling mom told me there was no way I would be able to manage teaching the children with six kids. Gee, thanks for the encouragement. Oh and let's not forget all the times people go on about how the youngest child will be so jealous and feel displaced. Which by the way has NEVER been the case. Or all the well meaning people who go on about how we can't fit another child in our little house or afford to support 4, 5, 6... kids etc. Never mind that with rare exception we have never even taken so much as free babysitting and our children are all well fed and well dressed. All the sweetness is not confined to friends, family and church members, though. Even strangers get in on the deal. In addition to the stares and comments about how we should "get a hobby" or cable and after 8 kids "don't we know what causes it yet", there are the women who tell me I'm crazy. Yes, perfect strangers have said that to my face. One stranger sticks out in my mind above all, though. After seeing me with 6 children and pregnant again she stopped me and asked all the usual rude questions. How many were step children? How many times was I married? And on and on. I answered her inquiries as pleasantly as could be. And then, as I put my item in the buggy and grabbed a toddler's hand to move on, she said, "You must have easy pregnancies to do that so much." Ha! I didn't correct her. I just wished her a good day and went on with my shopping. But I have thought about this woman's comment many times through my last three pregnancies and almost daily these last four months. Because easy and pregnancy couldn't be any farther from an accurate description of how things go for me. I spent two pregnancies on total bed rest with regular stays in the hospital with chronic poly-nephritis. And then there are the blinding migraine headaches that came with several pregnancies. The four or five months of severe sickness with most of our children. And then there is diabetes. As a diabetic, pregnancy means intensive insulin therapy and lots of testing to make sure my blood sugar levels always stay in a safe range for both baby and me. Some days that means 17 needles. And you know what that's the easy part. There's the hypoglycemia which comes with insulin treatment. That means in an effort to keep glucose low enough for baby I also have to deal with it dipping into dangerously low ranges for me several times a day. For those who don't know what diabetic hypoglycemia is about it means my mind stops working properly and I am unable to make even simple decisions like what to eat to bring my glucose back up. It also comes with an array of other less than pleasant physical symptoms. Everything stops while I tend to the situation. After this interruption into a visit with a friend, or teaching a lesson to one of the children, FBI class, a church service or a doctor appointment, I am completely physically drained as if I just had a run a few miles on a 90 degree day. On a good day that only happens a few times. The nights are the worst, though. After bringing my sugar up and showering and changing the linens (hypoglycemia causes you to sweat beyond anything you can imagine) I usually get severe chills. I then toss and turn for a few hours and doze off just in time to do it all again. And the fact of the matter is, unless you have been there, it is difficult or impossible to understand the true inability to do what I usually do... at church, in the community or even at home. So people aren't exactly understanding when you say no or don't show up for every event. We simply aren't able to help as we usually do. Even unexpected guests, which we typically welcome are very much a drain at this time. A few weeks ago I literally could not get the energy to type a text message reply and on three nights in one week we had friends drop by unexpected. So why am I here? I believe everything worth anything in life has a price. Some are higher or harder than others. This I believe is worth it. Indeed, I can't think of anything more worth the trial than being part of God's plan to give life to another human being. I believe every life is created by God. I believe every child is a blessing. Despite all the difficulties, I love being pregnant because I believe what God said in His word that every person is made in His image. And I believe the God who creates life has the power to see us through any trial He allows to come into our life. He's seen me through more than I can count in more miraculous ways than I can begin to tell here. I believe the God of Heaven has the power to provide for our every need. As we have followed Him by faith and He has expanded our family, God has always provided for our every need. In fact, I stand in awe each day when I see the ways He has blessed us with the desires of our heart and the ways He gives us opportunities to minister to others. So, I invite you to join us as we celebrate a new life and praise the God who has given and will sustain it. We look forward to seeing, not just how God will work in the next six months, but what He will do with this little life as he will rise up to serve the Lord. I can not even begin to imagine what great works our little one will be used for. But I sure am looking forward to watching the story unfold. And I am grateful for the gift to be part of it. Hugs to all the Wachters! Many congrats, Kat :) Carrie and I are wishing you all the best, and looking forward to getting out there to meet all of the family one of these days. SO SO Excited for you!! Praying that the next several months go smoothly and that you and baby remain healthy. What a blessing to your family! So excited for you! What an amazing gift, I think it is wonderful. I am glad this us the reason for your absence. I was worried amd emailed and when I got no answoer I was really concerned. Overjoyed for you and your family. Having 4 kids in under 4 years, we heard it all. It made me more aware of how I responded to other people and their situations. Think before I spoke kinda deal. So often, what others do has no effect on our lives, yet we feel it's our business. Large families are not for everyone, but you've got it under control and then some! best wishes for a smooth and safe pregnancy. You look absolutely amazing! Congratulations on this happy, happy news. I am disgusted at the things people have said. I had heard similar things when I was pregnant with the twins, our youngest (#'s 4 & 5) and it was difficult to hear. I can only imagine what you have gone through. Amen to everything you said in your final paragraphs about how each life is created by God. He has a purpose and a plan for each life and little Henry has one amazing family that he is being born into. I pray blessings, health, and healing over you, Kat. You are an amazing family, and this new little one will be the most blessed little guy ever. I would love to sometime hear how you respond to people's insensitivity. It is something I have a very hard time with. :-) Hugs!! I'm so sorry for the rude comments you've had to listen to. We are very happy to see another little Wachter enter the world! We'll be praying for you throughout your pregnancy. Hugs! Congratulations! I love large families and wish I could have had one. Growing up with just one brother, I always wanted more siblings. God blessed me with two children. He knows best and I know this is His plan. I'm so happy for you and your family!!! I do know what you're going through with the diabetes. The confusion, the seemingly drunken state that the lows throw you into, and the rush from bringing your levels back up. I've helped my dad many times with this and I know how very serious it is. I pray for God to grant you more than two feel-good hours each day. And I pray that people are more aware and more sensative with their words. My friends and I recently discussed the matter of taking good care with choosing words wisely. God Bless you and that little one! And once again, congratulations! The Lord indeed knows best and often His plans aren't our plans but when we are willing to joyfully accept His will we receive so many blessings! You are a wise woman to know that. The Word tells us it is the wise woman who builds her house. You have a perfect understanding of what I experience each day. I truly don't know if I could descibe it so well. Nor can I explain why it is such a comfort to me that someone gets it. But there you have it. Your email made me smile. Thank you for your wishes and prayers. It truly means a lot to me and my family. Congats!!! I am so happy for you!!! Many blessings to you and your family! Thank you so much for your encouragement. It is amazing to me how many times in the last four years the Lord has used this blog to lift me up in difficult times. I'm wondering how you and your crew are doing. I have not been able to visit blogs in so many months. I feel completely out of touch.